The Documents page provides you with the document management via the internet. Only authorized users have access to the current status of the project documentation. Emails, Microsoft Office documents and any other files can be saved in the central project folder via the browser. InLoox PM Web App saves storage space and avoids duplicate records simultaneously and can access the SharePoint Portal Server-Document Libraries. Virtually no additional storage space required, keeping InLoox PM projects lean. File rights are inherited. If for example you add a file from a protected network folder or SharePoint store to the InLoox PM storage, the file can still only be read and updated by authorized users - at no additional cost. Backup and existing version and document management applications can still be used. In the project, on the Start tab, in the Section group, click Documents. Choose first the document folder path in the new project to store the new documents. For more information see Create and change the document folder path. On the Edit page, in the Edit group, click New. Or click Edit to edit the document. In the Type area select File or Internet link. On the Path area, in the Subfolder drop-down list choose a subfolder, in which you want to copy the document. 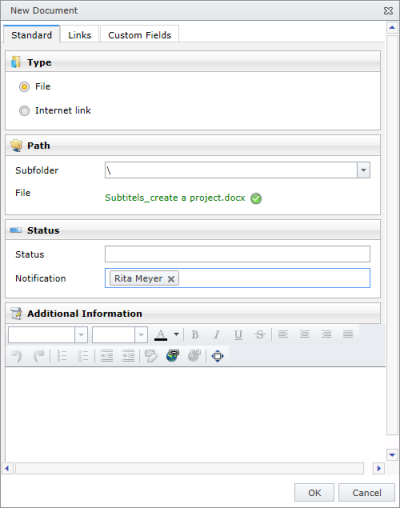 For more information on how to create a subfolder, see Create a subfolder. Then, in the Path box enter a path or internet link. For the document click Browse... in the File box and choose the document from the Upload File dialog box. Then click Open. Enter the web address for the internet link in the File box. In the Status area, in the Status box enter instructions, e.g. complete or awaiting release. In the Status area, in the Notification box choose the contact from the drop-down list or enter a new one to send the email message. Close the dialog box with OK and then save and close the project in order to send the email. The message includes information about the name, status and additional information of the added document. In the Additional information area, in the Notes box enter comments and remarks to the document. InLoox PM Web App provides you with the range of the formatting features. For the detailed description see Create and change comments in the Customize comments section. Choose between Planning, Time Tracking or Mind Map items from the Assign Document/Object Link box. InLoox PM Web App displays a document as a paper clip on the page you have chosen. You can also open the document on this page. You can open the chosen page. Select one from the list on the Links tab in the Documents area and click Open. If you want to delete the item from the list in the Documents area, click Remove. Click in the previously created custom box and enter a new value for it. For more information on how to add a new custom field in InLoox PM Web App, see Create custom fields. How to Save and Edit Documents in InLoox PM 7 Web App • Copyright 1999-2019 © InLoox GmbH. Tutti i diritti riservati.